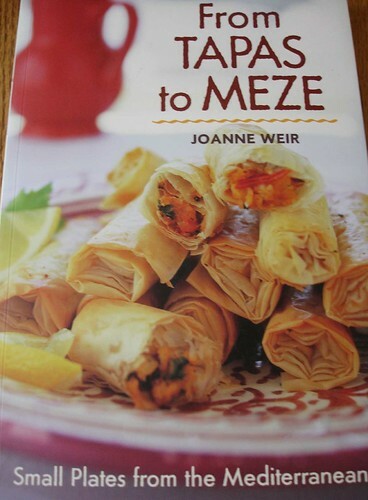 I recently purchased this cookbook, after taking a class from the author, Joann Weir about a year ago. Those of you in the Bay Area are probably familiar with her as she’s based in San Francisco and has TV shows (Weir Cooking in the City, etc) as well as other cookbooks. This was a new release of her first cookbook, the first release being out of print and, even used versions, going for $50 – $75 on Ebay! So for this dinner club meeting I chose as the theme, “From Tapas to Meze” and made a slight change to the way we make our dinner club assignments. This book is arranged by country and/or region and so instead of having people stick with the normal categories of “appetizer, salad, side, main, and dessert”, instead I assigned everyone a country or region. Since these were all to be small plates the only other rule was that they had to portion and serve on small plates – no platters or large bowls or other serving dishes allowed – and I’d have sets for everyone so they could just plate when they arrived at the house. 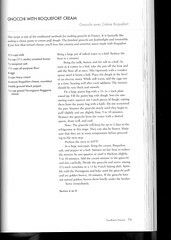 The recipes did not have to come from this cookbook (although I was hoping they would) but they had to be authentic to the region. Tried to go to your blogstreet profile and your technorati profile(((BOTH)))gave me a message BAD URL??? Food looks scrumptuous! And I couldn\’t get the URL for the Sassene site? Restricted?Banned?